After missing out on last year’s top 10, College Station, Texas once again ranks as a great place for working parents. For one, unemployment in the city is relatively low at 2.70%. Getting to work is also easy, given an average commute time of about 16 minutes. That’s the 20th-shortest commute time in the study. College Station ranks among the safest in the study with a violent crime rate that ranks in the top 25% of all cities. Childcare costs are low and rank in the top 12% of cities. College Station has been identified as Texas’ most educated city by Insurify. Insurify analyzed more than 1.4 million auto insurance applications that indicated the age and education history of each applicant. Within the data set, each was assigned a score based on educational attainment and, for current students, grade point average (GPA). The results were then grouped by city, and the highest scoring communities in each state were identified. Riding the rising tide of energy prices—and the job growth that goes with it—Texas claims the top spot in CNBC’s 2018 America’s Top States for Business rankings. This is familiar territory for the Lone Star State, which becomes the first four-time winner in our annual study, now in its 12th year. But it has been a long time coming. This is the first time since 2012 that Texas has claimed top honors. Not coincidentally, West Texas Intermediate Crude Oil—the state’s most important export—peaked at just over $108 per barrel that year, a figure it has not seen since. But it has risen enough—around 60 percent in the last year, powering through the $70 per barrel mark in June—to turbocharge the $1.6 trillion Texas economy. No one is surprised these days when College Station gets ranked among the nation’s top college towns, as a great place for business, or as one of the best places to live. The criteria publications and financial websites use to compile those rankings are usually based on data from the past year. The lists are usually divided into population categories, too. A website called CardRates.com is different. This week it was bold enough to make predictions about what’s ahead by publishing a list of “10 cities Primed for Economic Growth and Opportunity in 2018.” It included cities as small as 5,178 people (Evansville, Wisc.) to as large as 947,897 (Austin). By now, you’ve probably guessed that College Station made the list. Why else would we be blogging about it? But you may be surprised that we are ranked No. 1. That’s right. CardRates says College Station’s economy could be as good as it gets in the entire country in 2018. In developing the list, CardRates took factors such as pay, cost of living and unemployment rates into consideration. College Station is located roughly equidistant from Houston and Austin. Although the city has seen a population increase of about 25 percent over the last 10 years, College Station, with fewer than 120,000 residents, is large enough to offer city amenities, while still being small enough to maintain that hometown feel. 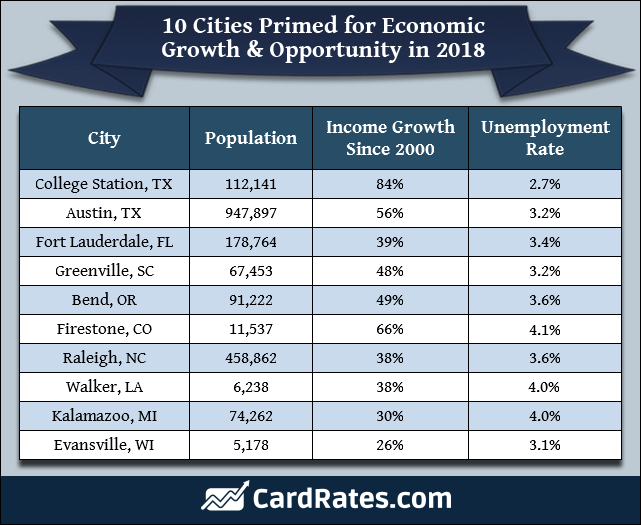 College Station’s unemployment rate is well below the national average at 2.7 percent, the lowest among the cities on our list, and the median household income has grown more than 80 percent since 2000. The city’s largest employer is Texas A&M University, which has its main campus in College Station, and is nationally recognized as a Land-, Sea-, and Space-Grant Institution. We already knew we were doing pretty well, but it’s nice – and a bit exciting – to know others feel the same way. College Station-Bryan hits the list at no. 5. Many of the hardest-hit regions over the decade, such as Rockford and Binghamton, are either manufacturing centers or home to a single industry. By contrast, regions with the top employment gains were college towns or those supported by tech or energy firms. SaveOnEnergy.com – U.S. Census data from over a five-year period has allowed us to see which cities people are moving to in Texas. The SaveOnEnergy.com® team sifted through census data and ranked the top 20 Texas cities with the highest percentage of inbound movers. College Station is home to the main campus of Texas A&M University, the flagship institution of the Texas A&M University System. The main campus is one of the largest in America, and has about 240 students per 1,000 residents. It ranks tenth in our College Destinations Index for its 7.9% unemployment rate and a 35.7% college educated population.